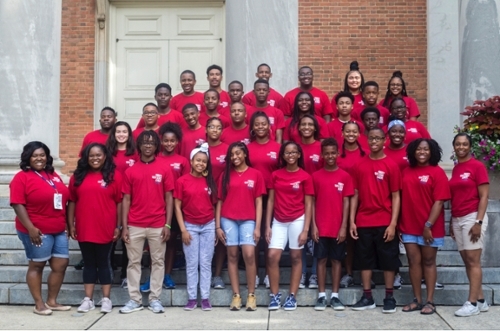 From June 17-20, Samford University hosted the Minority Youth Science Academy, offering college preparation and mentoring for Alabama high school students interested in careers in science, technology, engineering and mathematics (STEM) programs. Throughout the week, these students were involved in classroom and outdoor experiments, chemistry and biology labs and a trip to Birmingham’s McWane Science Center, followed by a wrap-up luncheon. At the luncheon, two students shared their favorite experiences from the week. Leilani Joseph, a student at Birmingham’s Ramsay High School, walked through the week, laughing as she talked about seeing a cadaver, experimenting with chemicals in a lab and looking at bugs up close with a microscope, learning about things she had never seen before. She thought the segment on neuroplasticity was one of the most interesting activities of the week. “I never thought I would be interested in neuroscience, but they made it so fun,” Joseph said. Likewise, Zachary Bone, at student at Buckhorn High School near Huntsville loved the camp. “It’s been a blast, and I’ve loved every second of it,” he said. His three favorite activities were learning about neuroplasticity, learning about mice and visiting Samford’s Christenberry Planetarium. During the planetarium presentation, students saw the planets in the solar system, hundreds of thousands of stars, all which have solar systems and the galaxies with their own stars and solar systems. “The being that created us, created the universe, and he cares about us,” Bone said, adding that he was blown away by the whole experience.